Actually, come to think of it, I would like boxes of candy year ’round. “Congratulations. I miss browsing in a fun comic shop. Like I said to him in response, yeah, I didn’t get much of a chance to get away from the register and take too many photos. It was literally a challenge to find enough time to pull out coin rolls to replenish the drawer, I was so busy. But I did have plenty of children pass through the shop that day, as particularly evidenced by my much-depleted shelves and racks of kids books and comics from which I sold throughout the day. All those Raina Telgemeier books…whoosh, out the door they went. I had to pull comics out of the back issue bins to refill the new kids comic rack, that stock got so low. 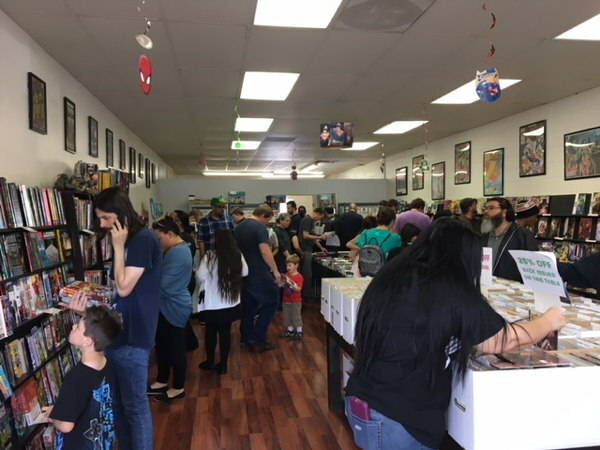 And I’m still getting kids into the shop for FCBD…there were plenty of people who couldn’t make it the day of, but I still have comics laid out for folks to take, and take ’em they are. 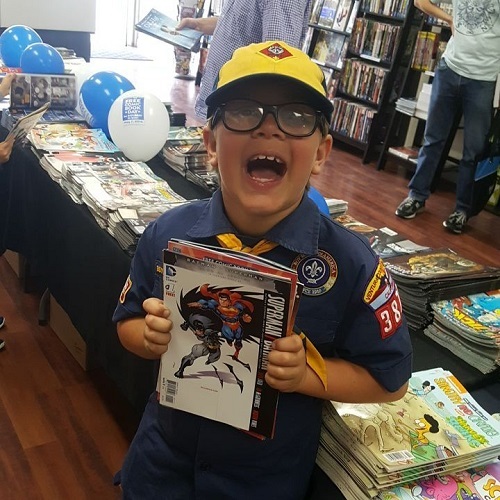 …but rest assured, I had plenty of customers of all ages who left the store happy and with handfuls of free comics! I explained Free Comic Book Day once as “like Valentine’s Day for the See’s Candies stores,” (or Easter, or Christmas, yes) which is sort of like what you’re saying. Okay, some people don’t need boxes of candy year ’round, but when that special day comes, they know where to go. And when Free Comic Book Day approaches on the calendar, folks know they need to seek out Ye Olde Local Comick Booke Shoppe. And yes, a whole lot of ’em do spend money while they’re on the premises. Yeah, I think there’s a lot more awareness of Free Comic Book Day now…it helps that it’s been around over a decade and a half, and it’s consistently put on every year at around the same time (except maybe that once). Local event publications made sure to note the day, I heard ads on a couple of the comedy podcasts I listen to (plugging the Starburns FCBD comic). It’s become just an “it’s that time of year again!” thing versus “hey, get this, people are giving away free comics, isn’t that weird?” I mean, sure, it’s not achieved 100% awareness across all demographics, but just from personal experience, when I ask people new to my shop (or any comic shop) if they’d heard about Free Comic Book Day, lately the answer is more often “yes, yes I have.” And hey, that’s good. That’s just one more positive thing for the general public to associate with comic book stores, which as a whole can use all the good press it can get. Free Comic Book Day 2018 is over, but someone tell my legs and hands that. It’s done, it’s done, and as you may have seen me announcing on my Twittererers, it was quite the successful one. Gave away more comics, had more people come in (swamped pretty much from opening ’til the late afternoon, and even after that we still had a good crowd), and, as far as actual cash/credit business goes, it was my biggest Free Comic Book Day yet at this store of mine…a 65% increase over the business I did my first FCBD here four years ago! No real problems or inconveniences I noticed this time…you know, the guy who always wants to look at all the dirty comics while the store is filled with kids, that sort of thing. I was a little bummed when a comic saver customer that I’d long given up on came in to ask for his pull, after not responding to any of my phone calls for months. Er…sorry, pal, gave you plenty of chances. But, you know, that was pretty much it. Well, at least they know about it! But boy, those paper trimmings just got everywhere. The most popular giveaway this year was the Spongebob book…ordered lots of those, and ran out of them right quick. There were a couple books that appeared to fit into the “not even for free” category, which I won’t name here so that people will be fooled into thinking I’m nice. But that’s the one downside of letting folks freely pick what they want off the tables versus what we used to do at the old store (create prefilled bags for different age groups, containing all the comics)…some customers just plain will not want what you’re offering. Now, the comics this happened to I didn’t order very high on, but still, it’s a little disappointing to see an unloved book just sittin’ there while its free comic brethren and sister-en fly off the tables. Pal Dorian (who helped out again this year, along with my dad, and my girlfriend Nora – big thank to all of them!) pointed out that Marvel “left money on the table” (you know, relatively speaking) by not doing a straight-up Black Panther freebie. Apparently we were getting lots of requests for such a thing, and yeah, that seems like a missed opportunity. I gave away that DC Nation comic, which threw a few folks off by the fact that there was as 25-cent price tag on the cover. “No, it’s free, honest!” I reassured everyone. And as usual, I sold a lot of new comics off the shelf as well…yes, “sold,” we were making sure nobody thought those were free, too. 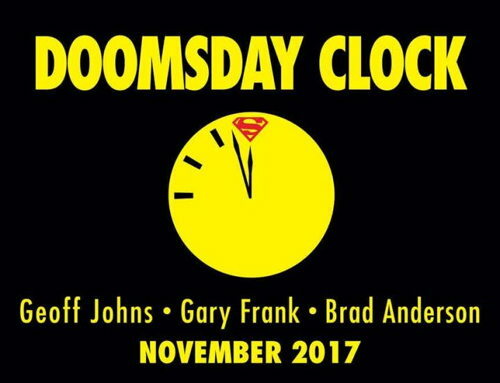 The big surprise was selling all the available issues of Doomsday Clock , but not as surprising as moving a bunch of that Jean Grey lenticular cover from a few months back that, um, I may have still had a few copies floating around. And I had a few of each issue of that Action Comics “Mr. Oz” storyline with the fancypants covers…moved quite a few of them as well. Speaking of Action , that #1000 just keeps selling and selling. Sold a bunch on FCBD, and I have a constant cycle of reorders on that thing. Remind me to speak further on this someday. 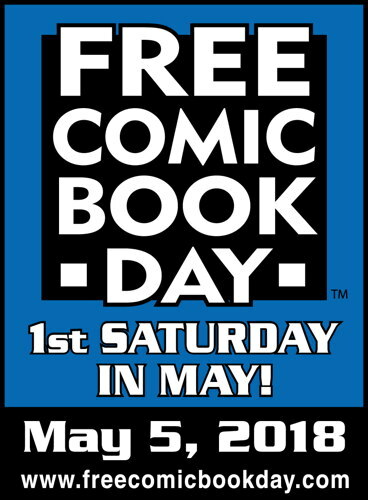 § May 5th, 2018 § Filed under free comic book day Comments Off on It’s Free Comic Book Day! Today’s the day! Get yourself out to ye olde local funnybook emporium and get your mitts on some free comics! And maybe help said shoppe out by buying a thing or two while you’re there! And most of all — have fun! If you happen to be near my store — like, on the same continent or in the same hemisphere — drop by! I’d be happy to see yoU! Pal Dorian has posted his picks for the comics of note this year, so be sure to pop over there and see what he has to say. Okay, this is a little earlier in the week than I usually post my “hey, Free Comic Book Day is this Saturday” reminders…I try to drop ’em the Friday before, but I’m not 100% sure how much bloggin’ time I’ll have Thursday night, so there you go. Also, longtime customer Mike W. told me he’ll look to my blog here for his FCBD reminder, so…hey, Mike W., see you on Saturday! 1) No purchase is required to take FCBD comics…if the store is making you buy something to take free comics, they’re doing it wrong. 2) That said, if you can, maybe do buy something while you’re at the shop…retailers do have to pay for the free comics which, while individually aren’t that expensive, can add up if you’re like me and ordered a whole lotta them. Also like me, many stores will probably be having special deals that day, so take advantage of them! Please! 3) But if you can’t buy anything and just want some freebies…that is perfectly fine. I want people to take comics and enjoy them! I mean, take the Free Comic Book Day comics, not the early 1960s Detective s I have in the case. I’m pretty much ready to go…at this point, all that’s really left to do is rearrange the store Friday night for the festivities the next day. All the freebies are in neatly-stacked boxes in the back room, I’ve got the roll of “I Got A Free Comic Today!” stickers ready to go, and I’ve got suckers family and friends ready to help out. So, now, all I can do is wait. 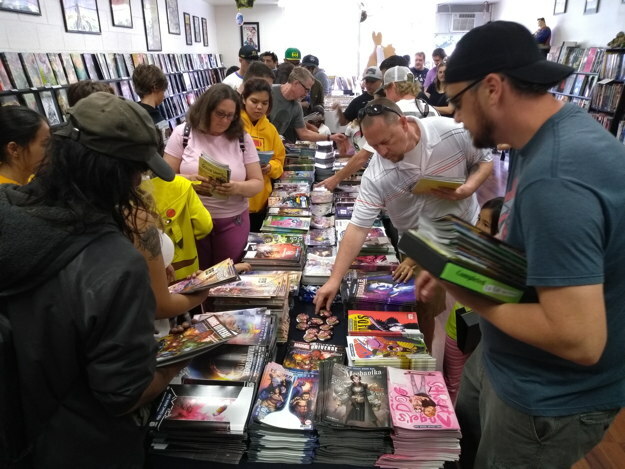 Speaking of said friends, pal Dorian will be on hand on FCBD to help me control the madding crowd, and, once again, he should have his overview of this year’s offerings posted on his site that Saturday morning. I don’t know how I manage to get him to do those reviews every year, but I’m glad he does ’em! Oh, and before I forget, let me point you to this article on my shop’s participation in Free Comic Book Day that ran in the local town paper, which also featured a couple of my customers. 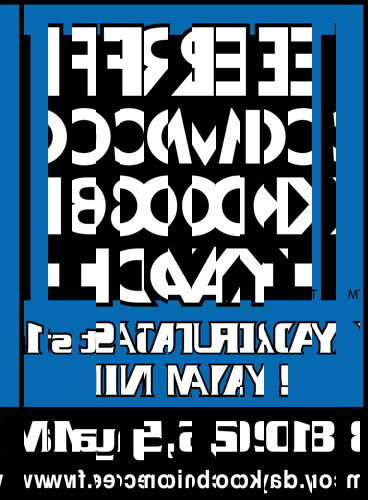 Nice, right? Okay, if I don’t talk to you again before the day, everyone have a fun and safe Free Comic Book Day, and I hope you all find some new comics to enjoy! Also, maybe buy a couple things! A suggestion, not a requirement! Maybe Dr. Manhattan can work on the Marvel Universe next. Well, by cracky, that appears to be the case, doesn’t it? I guess I hadn’t really noticed…when you’re slogging through 500 pages of Diamond Previews , it’s easy to overlook the fact that maybe something that should be there isn’t. And, a quick check at the distributor’s website shows nada forthcoming from Archie Comics involving any sort of spiny mammal content. I did a quick buzz about the Internets and saw a lot of discussion on the topic, so I guess I’m just not looking in the right spots to have had this particular bit of information at my fingertips. It’d be a shame if the Sonic comic book franchise did vanish from the stands…especially since Archie still has that prime grocery store placement. Hoo boy. The Secret Empire event comic is the wagon Marvel is hitching all its chickens to for the next several months, so of course Marvel is going to want one of their FCBD comics to be a plug for it, like their Civil War 2 freebie was last year. Now, by and large, a lot were given away, and a handful of conversations I overheard seem to be at least intrigued by the concept — “whoa, Captain America is a bad guy! ?” It’s yet another “how does our hero get out of this one?” story, designed to unfold over the next several months and keep readers in suspense. No one really thinks Cap is going to stay a bad guy, and that everything will be fixed. How it will be fixed is naturally the hook for the event. That’s a lotta typing around Dean’s question, so let me see if I can narrow it down a bit. For folks coming into the “Secret Empire” event fresh, the FCBD giveaway may be have been an intriguing introduction to the event. For folks who are more aware of the historical context and of the current reaction to said event, the FCBD book was probably just digging that hole a little deeper. Personally, I feel like this is a bit like the Spider-Man Clone Saga from the ’90s. If they told the story, were in and out and done in, like, six months, it would have been fine. But dragging it out like this, particularly in the face of increasing consumer rejection, isn’t doing the company any favors. The Clone Saga almost killed the Spider-Man franchise, leading to a more-or-less still ongoing series of relaunches and reboots. Not that Marvel’s been shy about relaunching/rebooting any of their titles lately, but I suspect Cap may need some serious refurbishing after this to get readership back. On the other hand, Secret Empire sales in the shop have been ticking upward in the last week or so, so what do I know. …I hope this never, ever stops. 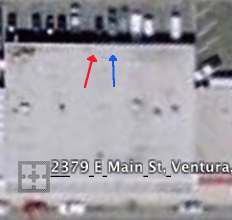 That red arrow is pointing at Pal Dorian’s old car. Oops, sorry, I really was planning to have a post on Friday, and then when I missed that, a post on Saturday…but I have an excuse, honest. I was out car-shopping, and then, eventually, car-buying, over the last week, and was coming in awfully late and very tired in the evenings. Turns out that, if you’re running a shop seven days a week, that doesn’t leave you with a whole lot of time to do other things, like, oh, say, getting a new vehicle to replace the old about-to-die one. …was well north of 200,000 miles on the odometer, and a visit for a smog check resulted in the mechanic telling me “I can’t test this thing,” so that, and several other issues, resulted in the need for a new Mikemobile. And thus, the 1994 Mazda B2300 is dead, long live the 2016 Hyundai Tuscon. …Actually, I tried to buy used, but it turned out there was nary a difference in price between a used 2015 Tuscon and a new 2016 one, and frankly, instead of driving a car that already had 20,000 miles on it, I’d rather put those 20,000 miles on it myself (or approximately 1,200+ trips back and forth between my home and the store). So anyway, I have a new car, with all kinds of crazy electronic gadgetry I have to learn, as my previous vehicle was essentially a collection of levers and pulleys and this new car is like a more advanced version of KITT from Knight Rider . But now Caveman Mike have new magic machine to bang club on, and Blogging Mike should be back on schedule with his website. Thank you for your patience. Oh, and by the way, on a completely unrelated note, now might be a good time to, say, come shop at my store, or maybe buy something from my eBay listings, or even patronize my Patreon. Or just overnight me a shoebox full of twenties, that’d be okay, too. Okay, how ’bout some comic book-type stuff? 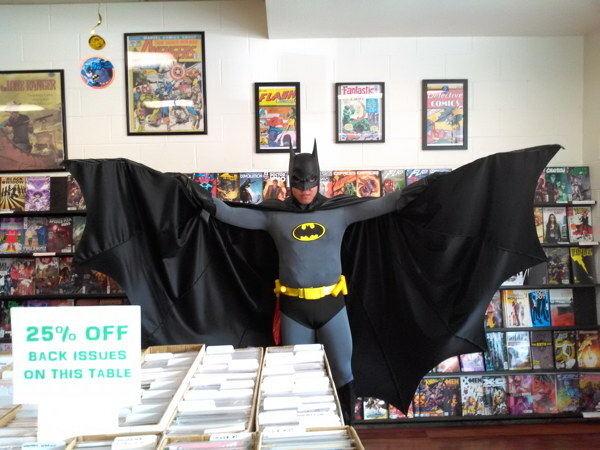 I kept meaning to do a little write-up about DC’s Batman Day event, in which DC tries to get the word out about this crazy dude what dresses like a bat and fights crime. Yeah, okay, it’s the comic industry’s version of advertising Coca-Cola, but there’s usually a freebie of some kind involved (this year, a reprint of the recent Batman #1 from the Rebirth event), and it does get folks into the shop. I did the same thing I did last year, and set up a table filled with Bat-books and boxes of back issues and offered discounts on all the stuff, and did some pretty good business. Certainly there were people out enjoying Batman Day decked out in their Bat-regalia…shirts and dresses and the like, and I barely had to advertise it at all for the event to be considered a success. Now, this is all part of trying to create Free Comic Book Day-esque events throughout the year to generate business for comic shops, like the still-forthcoming this year Halloween-Fest and Local Comic Shop Day. That’s fine, I won’t say no to stuff like this that’ll boost sales, especially when they don’t really require a whole lot of effort. Advertise, have the goodies ready for the day, and be a happy and polite retailer that welcomes everyone that comes into your shop. Actually, that’s good advice year-round, though it sounds like some folks can’t even manage that minimal amount of effort, as related by pal Shane on his Twitter. Oh, and I did another Back Issue of the Week at the store site, too. These are fun to do! Maybe I should start a comic book blog. And one more bit of Turok Dinosaur Hunter first issue follow-up from last week: read this account of the dreaded fate that befell approximately 5,000 copies of said comic, if you dare. Oh, and I forgot to mention the cost of the balloons. THE BALLOOOOOOONS. Well, it mostly depends on how many of the FCBD comics you order. They average about 25 cents apiece, and I ordered several thousand comics, so you can work that out. On top of that, there’s the cost of advertising (like the ads I ran in the newspaper, coupon flyer, etc. ), and the cost of paper ‘n’ ink printing out little flyers to give away in the shop, and the cost of the preprinted FCBD merchandise bags, the tchotchkes (like the FCBD keyrings) and so on. I don’t particularly want to get into exact numbers here, but it probably cost me an amount equivalent to one of my higher weekly Diamond invoices. As I noted, I may have spent a little more than necessary as I overordered a bit on the FCBD books this year. I keep feeling defensive about the leftovers, because I still have a table sitting out with the freebies for the customers and it almost sorta looks like I didn’t give anything away. I did, plenty more than last year, but that remaining 10 or 15% is still a good chunk’a books. (Which are quickly thinning out anyway, so it looks like I’m not going to have too much leftover stock after all!) Next year’s orders will be normalized a bit, so those costs will be down slightly. Now you don’t have to be a crazy person like me and order boatloads of FCBD comics. 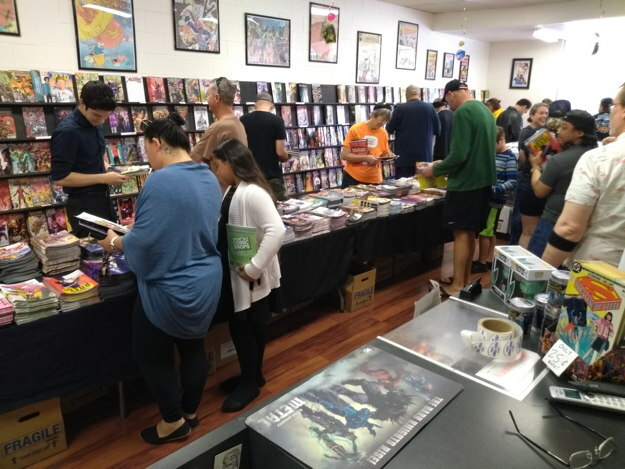 I like to make it an event, with sales and guests and such, but it’s probably possible to have a low-key FCBD event and not go so overboard on the book numbers, keeping your costs down and rewarding the regular customers with some free stuff. I remember hearing in the early days of FCBD about the shops that would just have a small box filled with the free books sitting on a table, with nothin’ going on to indicate that anything special was happening, which seems like it would be a little too low-key. I like having the big FCBD event, which means spending more money, but I’ve been fortunate enough to have that investment repeatedly repay itself year after year, both at the previous place of employment and at my new shop. It was a risk that, so far, has always paid off and is not so much of a risk anymore. I know that may not be the same result for every shop, but thankfully that’s how it’s been for me. And I realize I keep talking about making money on the whole deal, simply because there are some folks out there how find it hard to believe that a comic shop can pull a profit on giving away free stuff. 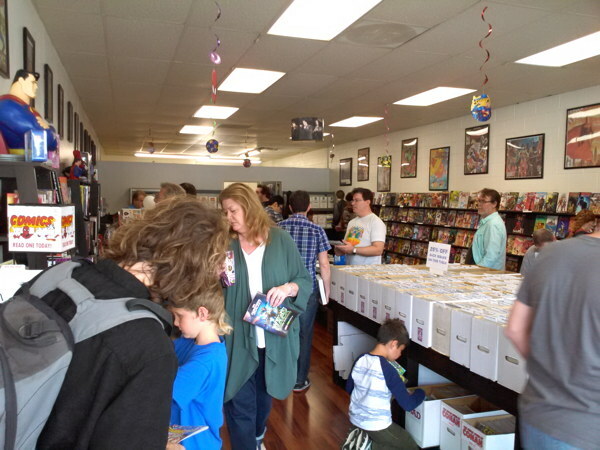 What’s best about Free Comic Book Day, however, is seeing the tons of kids pile into the store and happily coming away with a stack of comics they can’t wait to read. That’s the real profit, if you’ll excuse that brief moment of cheesiness. Okay, now next Monday I’ll get back to your questions. Thanks for reading, and I’ll see you then. I’m too tired to think of a clever Free Comic Book Day-related title for this post. You know, it’s really hard to say. 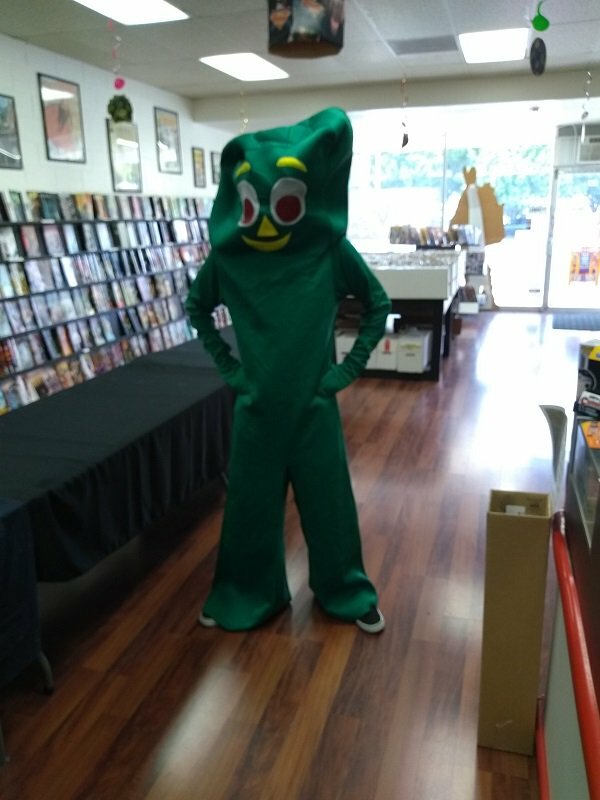 I know I had several people very excited about his appearance at the shop, so I’m sure it encouraged some good measure of traffic. But, as you saw yourself when you were there, it was very busy, particularly just as I opened, so it’s hard to say when dealing with this number of people how many were there for the free comics and the deals, how many were there just for Jaime, and so on. I did see a few people make a direct line right from the front door straight to Jaime, so those folks I can probably count in the “we’re here for the Love and Rockets guy” camp! Earlier in this site’s life we had plenty of back-and-forth in the comments about “limits” or “no limits” on FCBD. I am very firmly in the “no limits” camp, as in “take one of each if you’d like” (so long as they’re age-appropriate, of course). (And even then I might let the “one of each” thing slide if they’re taking copies home for sick kids, or friends who couldn’t make it, or whatever…just as long as they’re not grabbing the entire stack of Suicide Squad #1.) However, I do understand stores that put limits on how many different comics people can take, whether it’s to stretch out stock because they could only afford to order so much, or, you know, whatever reason it might be. Every store is different, with varying needs and customer demands and so on, and what might be right for me may not be in the next retailer’s best interest. In my case, my belief is that FCBD is for letting people get exposed to as many new comics as possible, so not limiting their choices is my preferred, and so far successful, strategy. If I had to have limits, what I would probably do is not include the Big Ones in the limit count…like, order tons of the Marvel and DC freebies which everyone will want, and don’t count those toward whatever limit you set. I noted during my Twitter comments on FCBD that, even though I didn’t have a limit on the number of different FCBD comics you could take, most people didn’t take one of each of the 50 different titles that were available. Yes, of course some people did, but just as many people just took one or two comics, even after being reassured they could take more if they wanted. This has been my experience the entire 15 years I’ve been doing Free Comic Book Day. Even early on at my previous place of employment, where we prepared prepacked bags (divided by age-appropriateness) and people could get every FCBD book if they took each of the Kids, Teens, and Grown-Ups bags, not everyone did. A limit didn’t have to be enforced, because, well, it all evened out in the end, more or less. As far as leftovers go…like I said Monday, at the old shop where I had the numbers down, we had barely any leftovers at the end of the day. And last year, the first FCBD at my new shop, by some miracle of guesstimation I ordered pretty close to exactly what I needed, leaving me with only a relative handful. This year, not knowing how much extra traffic I was going to get, I overordered by a pretty good amount, and even though I did give away a lot more comics this year, I still had maybe about 15% or so remaining. Which is okay…I’ve already reduced that by quite a bit by leaving a table out and continuing to give them away to people who didn’t make it that Saturday, and donating some to that school. And as I said, this will help me gauge my orders for next time. Andrew wondered about my reaction to this FCBD article, in which retailers express their feelings, positive and negative, about the event. Well, like I said above, each retailer’s needs will be different, and FCBD can been a boon to some, a burden to others. All I can tell you is that I’m glad, at my previous position and at my own store, that I’ve been able to take extreme advantage of it to great personal benefit and profit. Someone always asks what the long term results are from Free Comic Book Day. In the short term there are of course, if you’re able to manage it, the significant one day profits from the huge amount of increased business. But, as the person in that linked article noted, folks who come in just for the freebies aren’t going to turn into weekly customers. And that’s okay. It’s enough to remind your local community that, hey, your store exists, and comics exist, and that they’re their own thing and not necessarily just R&D for the movies you like. And maybe down the road if they find they do have a curiosity about comics, or if they need to buy a comic-related gift for someone, maybe they’ll remember that nice store that gave them some free comics that one time. And if you have a good enough sale that day, you can clear out some old stock and make room for new stuff. …Sorry, as a retailer, I gotta think about that stuff, too.